In blender, place all ingredients except mint sprigs. Cover; blend on medium-high speed about 30 seconds or until smooth. Pour into 8-inch square (2-quart) glass baking dish. Freeze 1 hour. When ice crystals begin to form at edges of dish, stir mixture with fork. Freeze 3 hours longer, stirring every 30 minutes with fork, until firm. Serve frozen or let stand at room temperature 5 to 15 minutes before serving. Scoop into individual dessert bowls. Garnish with mint sprigs. 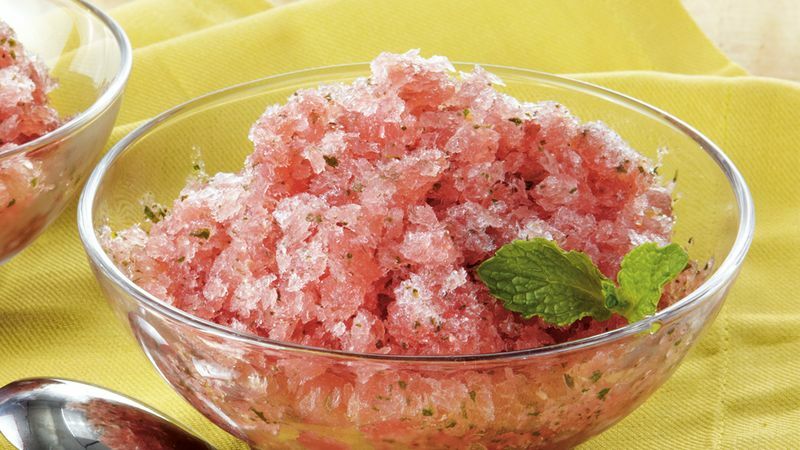 Bottled simple syrup makes this granita quick and easy, removing the step of making your own simple syrup and cooling it. Look for simple syrup in the wine and beer aisle of your local grocery store.